Having a stockpile of items is one of the best ways to ensure you always have what you need and save money by not always having to go to the store. But I know a lot of people either aren’t familiar with using coupons to maximize savings, or are just plain too busy! And stockpiling doesn’t have to involve going to Sam’s Club and buying the big boxes. 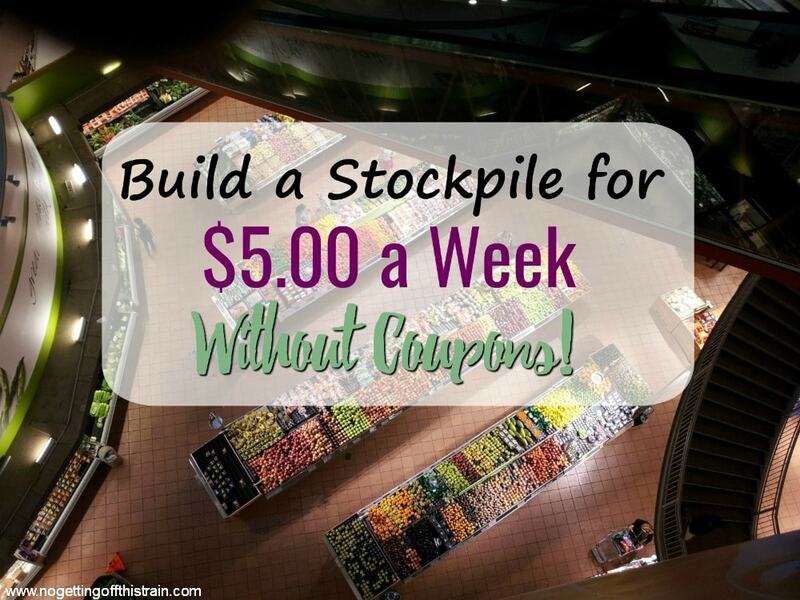 Would you be willing to set aside $5.00 a week to help build your stockpile? This method doesn’t involve waiting for the perfect sale or printing out tons of coupons. 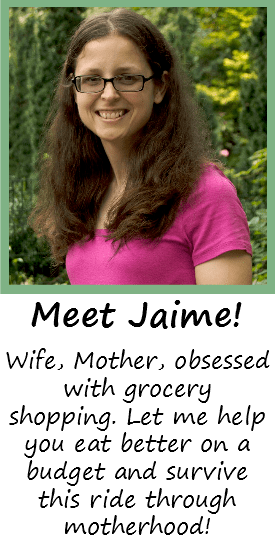 All you have to do is spend $5.00 on as much of a specific item as you can each week to fill your pantry. Included in this list below is 18 items you can buy in a rotation to ensure you never run out! It’s amazing how much you can stockpile with $5.00 a week. Customize this list to fit your family’s needs, and in whatever order you need to. If you use whole wheat flour, buy that instead! If you don’t buy canned veggies, buy frozen! The list below consists of things that I personally buy for my family. I bake my own bread/rolls, so a lot of what’s below is used in my baking. And in some cases you may want to save your $5.00 for the next week for items like toilet paper if you buy the bigger packages. When you reach week 19, you can start all over again! I use the “Cream of” soups for cooking, and the canned tomatoes are used for spaghetti sauce. Click here to print a PDF of the image above that you can stick on your fridge to help you remember what to buy! What are YOUR favorite items to stockpile? Share in the comments below! Coconut milk is a good one! I need to see if my Aldi still has them; it was a seasonal item. There are 6 people living in my house. We have to stockpile in order to survive. 😛 We have to go through and organize what we have and figure out what we need more of. We followed a plan similar to this one to get it up though! Awesome! I can’t even imagine buying for 6 people. I have enough trouble with 3! This would help my budget soo much! I feel like I stock up on too many things in one week then I’m broke the next time I go to the store… I love this idea. Thanks! Haha, I tend to overstock sometimes too without realizing. =) Sometimes there are just such great deals! 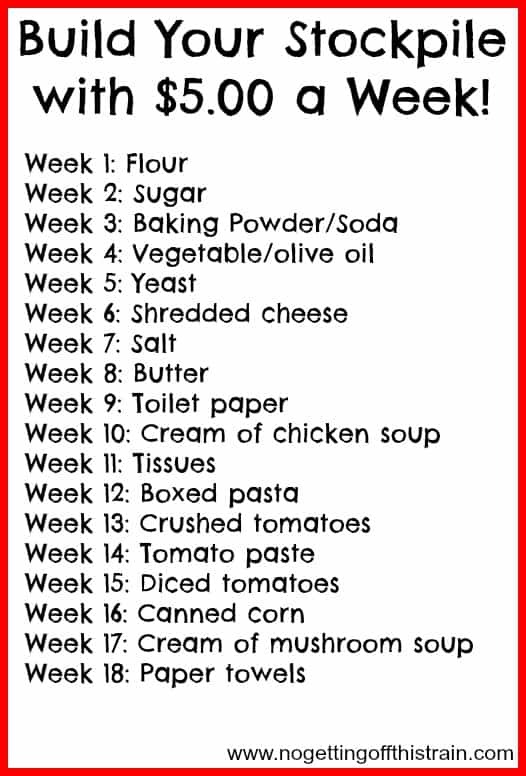 This is super helpful, I meal plan but my budget varies so widely from week to week, it would be great to have some of these items in reserve. Awesome! It’s so nice to have staples on hand for emergencies. I really like this list for sure. Thank you! I hope it helps you! Great info! I’m going to give this a try, thank you. I love this list! I really need to build a food storage for emergency type situations and this would be perfect. I can totally do $5 a week! Thank you so much for the motivation to get moving on this! You can stockpile some items for far less than $5 if you buy a #10 can (ginormous size) at $3 or so and then freeze portions in quart size bags. I do this with several foods, such as tomato sauce- make a giant bowl of pasta sauce and freeze. Or pineapple bits- my children prefer it frozen anyway, and we make popsicles with the juice. Mushrooms- break off what you need from the frozen bag. Corn- and the juice makes a jam that tastes like apples from what I hear (on my list to try!) More stockpile tips are linked to my name! Definitely, buying in bulk really helps! If you can get it even cheaper than $5, that’s awesome! 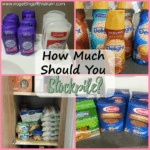 I never thought about making a list of stockpile items. I always wait for things to go on sale but then I end up with a lot of something (like white sugar) and none of something else (like wheat flour). This is such a great idea! I kinda do the same thing, haha. =) Usually with things like coffee creamer. You don’t want to see the bottom drawer of my fridge. I budget up to $20 in my meal plan for whatever loss leaders catch my eye. Thanks for posting. Hello from Thrifty Thursday. Paper towels are just something we use in the house and like to keep a good supply. =) If they’re something you don’t use, you can always substitute it on the list for something else! Dollar Tree had/has Hunts organic petite diced tomatoes for 2 for $1.00 so I bought a case of them the other day. Whenever I see a good deal on something like that, dry beans, etc, I buy it to put in my extended pantry. People buy insurance for their home and car, so building a stockpile of food with $5.00 a week is like food insurance in case of an emergency. 🙂 Love your blog! Thank you! =) I think I’ve actually seen those diced tomatoes at Dollar Tree; it’s such a great deal! I save up and watch for the twice yearly case lot sales. They are better deals for us where I am in Canada as there is significantly less couponing here. Just don’t think you have to get to a significant pantry all at once. Keep the size of your family in mind so you can rotate through it and not throw stuff out because it expired or went off. I kept a smaller stocked pantry than I really wanted to for years as I did not have the money to just have sitting there on my shelf as the budget WAS THAT TIGHT. So I always could throw 2 or three extra meals together in a pinch or a nice company meal. I could bake a cake or cookies and muffins galore and my own bread if needed. There just was not a lot else in it other than extra dry goods so I did not run out of TP at 11pm . lol. I had the next one to open of everything else. I’ve never seen a case lot sale! That’s cool that you can get some really good deals from that. =) You’re right about keeping your family size in mind; we’re only a family of 3 and I feel like I need the entire grocery store! It’s hard to get that balance.